The golden years are brightly shining on Modesto property. With a little help from the Modesto Senior Center older folks are living their best lives. 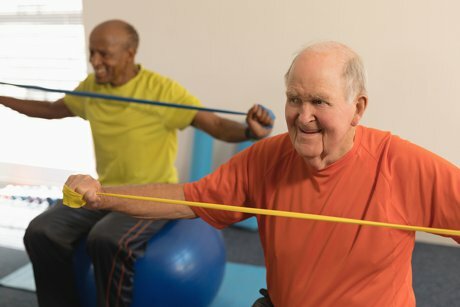 Social activities, classes, health screenings and nutritional meals keep members on their toes. Located at 211 Bodem Street, the center is brimming with life. Keeping in shape is easy with athletic classes. Aerobics, strength training and Zumba keep energy high. Arthritis sufferers can still stay fit with Tai Chi and yoga for arthritis. Wily competitors square off for games of chess, bridge and bingo. Other drop in games include Mexican Train, Bunco and Mah Jongg. Seniors stay safe with scam prevention classes. Walking groups meander around landscapes close to the Modesto Senior Center. Social butterflies join the Red Hat Society. A national organization comprised of energetic senior women known for wearing purple outfits and red hats, members encourage friendships and social interaction. The Modesto Scarlet Sparklers Chapter gets together once a month at varying Modesto property restaurants. Ladies enjoy a delicious luncheon, play games, and chatter away the afternoon. Movie matinees are held in the auditorium. Old time favorites shown on the big screen bring back memories of the good old days. It’s never too late to learn something new. Seniors living in Modesto can get a grip on the latest technology and become proficient in no time. Volunteers share their expertise with the Teaching Seniors Technology program. Held in 30 minute one on one sessions smartphones, computers, tablets and other devices are conquered. Grandparents quickly catch on and are eager to display their newly found knowledge to their offspring and grandkids. The Modesto Senior Center nurtures its members. Senior meals merge mingling and nutrition Mondays, Wednesdays and Thursdays at 11:30 a.m. Reservations are required and can be made by calling 209.480.4337.